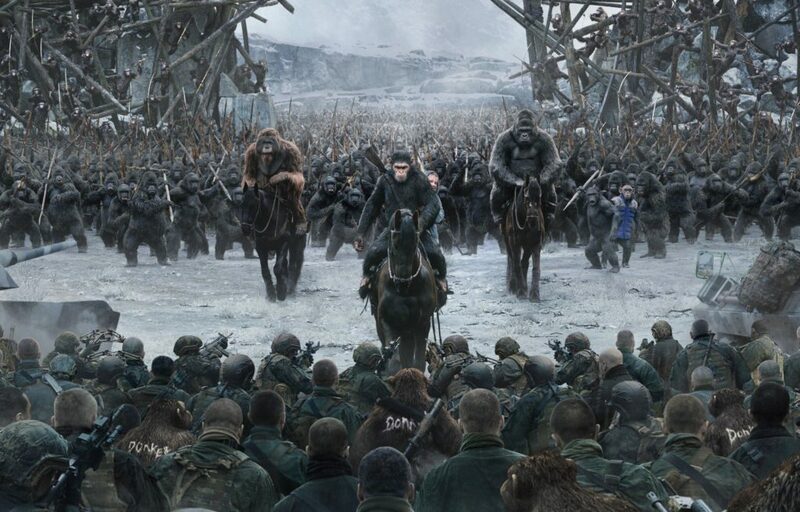 'War For the Planet of the Apes' Review: Drama Is "Riveting But Brutal"
The visual effects are out-of-this-dystopian-world fantastic, obviously. 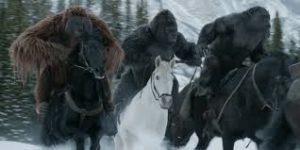 Nimble apes gallop on horses along snowy vistas, and it looks as natural as Leonardo DiCaprio riding in The Revenant. But there’s little fulfillment in seeing a movie just to witness new digital technology. Old-school elements are crucial: A riveting story. Intelligent characters. Heart-pounding action. Profound themes. The War for the Planet of the Apes features all of the above. 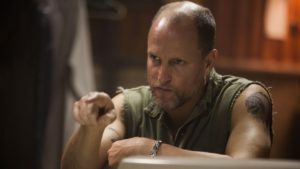 The remaining soldiers of the American military, led by a man known as the Colonel (Woody Harrelson), are determined to assassinate him and decimate the civilization. The military don’t succeed, but they manage to emotionally cripple him. RIP to his wife and son, both killed in a late-night raid. 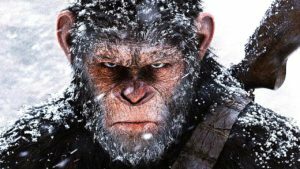 While the rest of the apes try to find a haven, Caesar and his allies hunt for the Colonel. Along the way, they pick up a mute human girl (Amiah Miller) inflicted with the virus, as well as a high-pitched chimp (Steve Zahn) who refers to himself as “bad ape.” The bad ape used to live in a zoo and provides the comic relief. That ain’t saying much. Caesar’s uneasy transformation from pacifist to revenge-seeker fascinates. From the outset of his reign, he has implored his tribe that if they show mercy against the humans, the humans would, in turn, lay off. In Rise, he exiled his No. 2, Koba, for rebelling. These deaths have shaken him. Now he accepts the vengeance within. Again, this is a primate. The amazing Serkis, who memorably “played” Gollum in the Lord of the Rings trilogy, infuses Caesar with genuine weariness behind the eyes. It’s a truly remarkable performance. Not quite Oscar-worthy, but remarkable nonetheless. When the Colonel and Caesar finally meet in the barracks, the face-off is fraught with plausible tension. Harrelson, sporting a shaved head and a measured growl, is engulfed in a heart of darkness — even as he relays a tragic anecdote about his own son. Caesar responds as a veteran leader haunted by loss yet confident in his powers. This is pure Survival of the Fittest territory. And, yikes, the apes’ mission is so sound that the knee-jerk reaction is to root for the humans to lose. Mind you, this is also the film’s major flaw. Unlike previous installments, War has little interest in further exploring the complicated relationship between man and ape. Lines have long been drawn. Fleshed-out characters (played by Jason Clarke and Keri Russell in Rise and Franco in Dawn) that once behaved out of curiosity and concern are gone. Only the Colonel’s nameless, faceless military men remain, and their mission is to enslave and, preferably, exterminate. In contrast, Caesar is presented as a heroic Moses-like figure set out to lead his people to the promised land. No wonder it’s easier to invest in the primates. The grimness permeates in every moment — and in a meditative movie that lasts nearly 2 ½ hours, I craved a refuge of wit and warmth. And, well, one less extended attack scene. There’s no question the film is going to be received with deep admiration. But despite its considerable strengths, I do wonder if it will be equally beloved. « Ben v Casey: Which Affleck Brother Has the More Impressive Career?